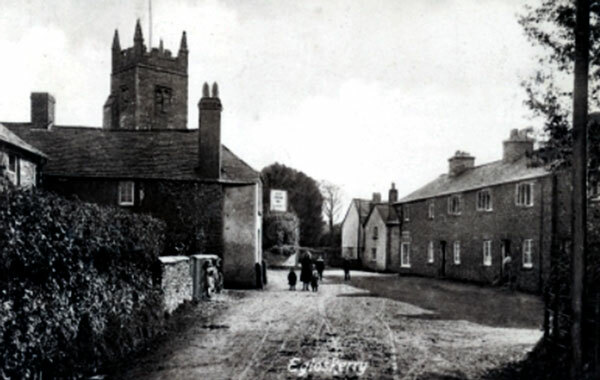 The History of Egloskerry | Launceston Then! 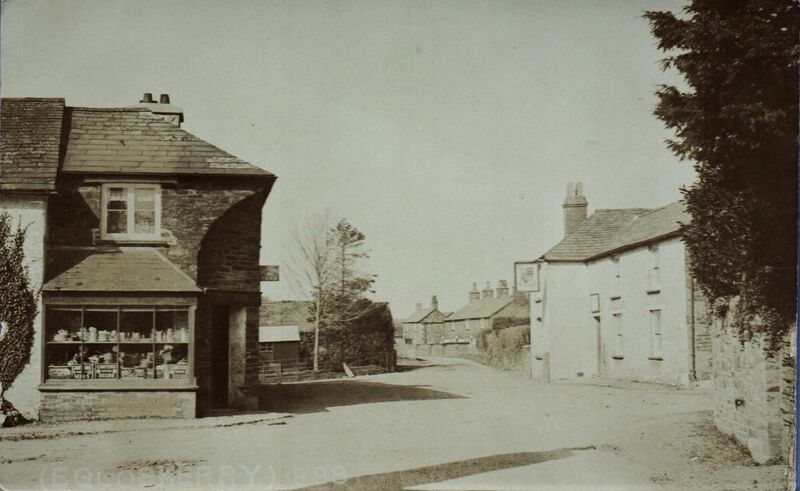 The Simcoe Arms, Egloskerry c.1910. Egloskerry is a village about 4 miles south-west of Launceston with the parish encompassing Tregeare, Badharlick, and Trebeath. 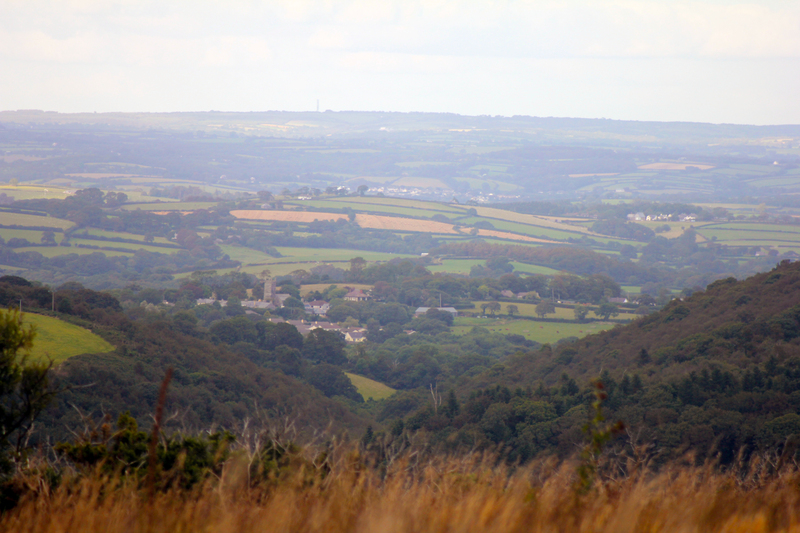 It is bounded on the north by the River Attery (Ottery) which separates it from the parish of North Petherwin, on the east by St Stephen-by-Launceston, and St Thomas-by-Launceston, on the south by Trewen and Laneast, and on the west by Laneast and Tresmeer. 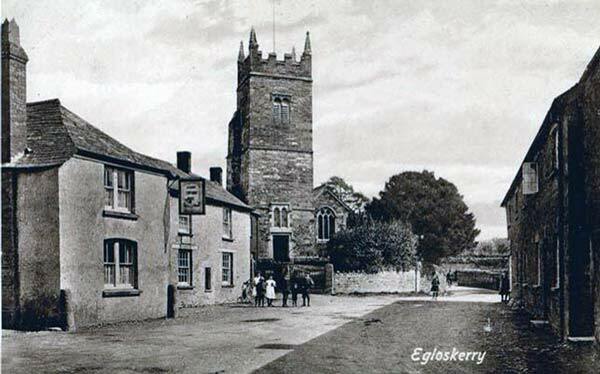 The name Egloskerry is Cornish for ‘Church of Keri’. In the Domesday Roll, 20 William I (1087), this district was taxed under the name of Pen-hall-an, now Penheale. Soon after the Norman Conquest, if not before, the De Boterells, alias De Botreauxes, were in possession of the manor. Although Penheale Manor dates back to the Domesday Book of 1086, the architecture of the house today is mainly 17th and 20th century. 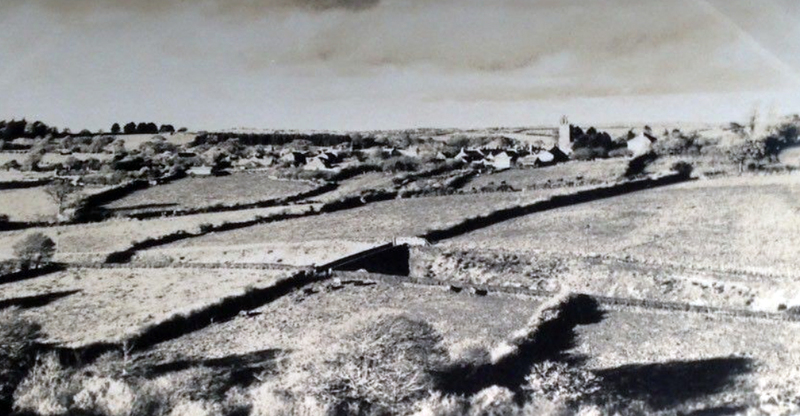 The estate still farms a considerable area of land, both in the parish’s of Egloskerry and of North Petherwin. 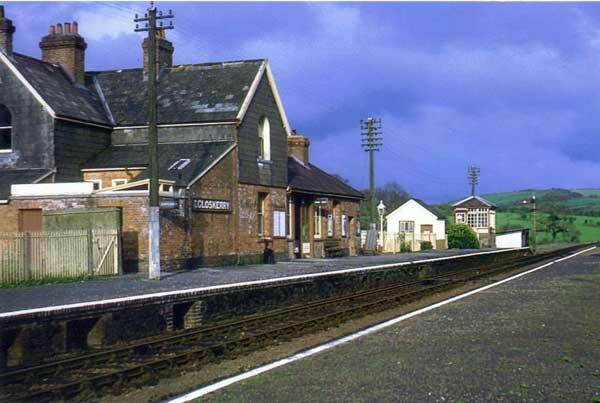 The village was placed on the national Railway map in 1891 with the building of the line from Launceston to Padstow. 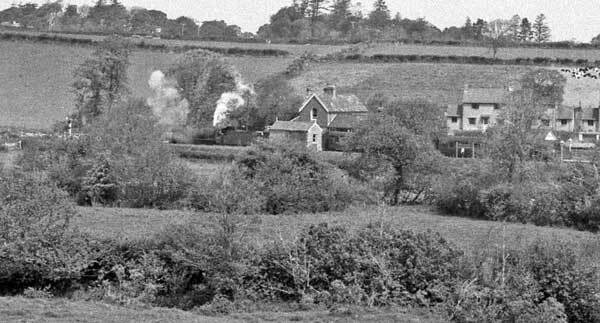 The road from North Petherwin at the junction with Langore is a consequence of the railway, as before it was just a narrow cart track, but to improve the railway communications with the outlying parishes, the North Cornwall Railway Company paid for the track to be widened and improved. 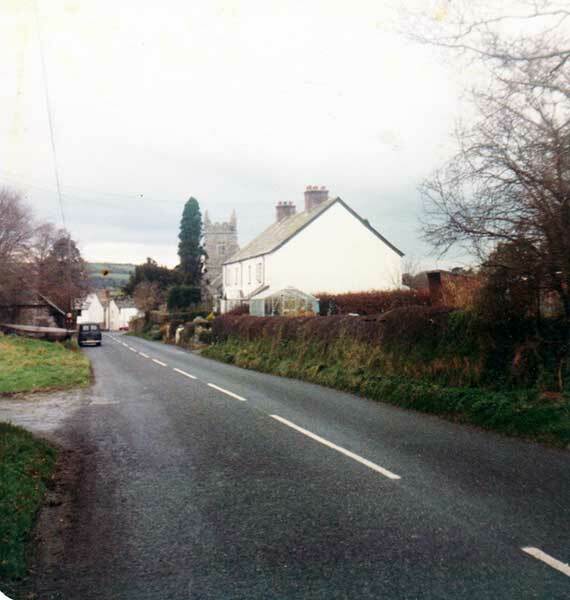 For many old ‘Skerryites’ this piece of road was always known as ‘New Road’. In the good old days when our churches were founded it was the custom to dedicate each building to a saint, and the saint’s day was kept as a holy day in each succeeding year. Both the saint’s name and the holy day is said to have been forgotten at Egloskerry. Local tradition, however, assigns to Kyryacus, Bishop of Ostia, in Italy, who is said to have been martyred in 226, the patronage of this church and supposes the name has been derived from him, viz. ‘The Church of Kerry’. 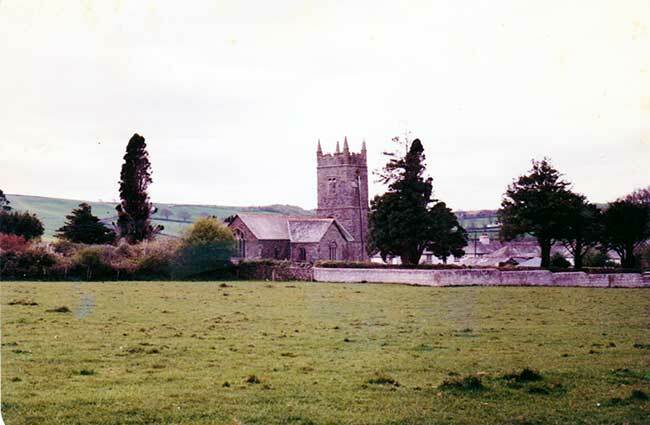 The first religious foundation at Egloskerry was attached to the Manor of Penheale, which manor is one of the few satisfactorily traceable from the Domesday Survey to the present time. During the reign of Edward the Confessor, Penheale (Pennehele) and Egleshos were both held by Harold who, in 1066, fell at the battle of Hastings. In 1085 the Conqueror William took possession of Penheale and gave Egloskerry to his half-brother Robert Moreton, Earl of Cornwall. It came afterwards to Ricardus, whose son William fitz Richard, left a daughter, and sole heiress, who married Reginald, Earl of Cornwall, son of Henry I. The Earls of Cornwall were then occasionally resident at Launceston, and entrusted the spiritual welfare of their manors to the care of the Priors of Launceston. 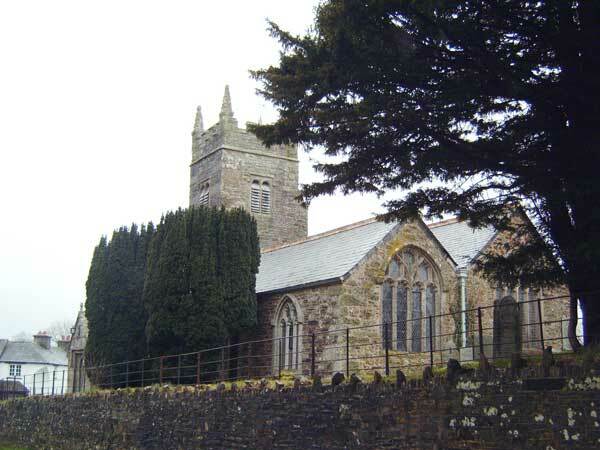 At the time of the Dissolution we find the prior receiving £11 for tithes and a pension of £1 6s 8d from Egloskerry, and also £2 13s 4d for sending a Chaplain to celebrate Mass twice weekly at ‘Penhele’. Penheale has been embodied in more than one work of fiction, and especially, we think of one written by the Rev Baring-Gould of Lewtrenchard. The site of the first church was probably a portion of that occupied by the present building; remnants of early stonework have been discovered in the existing walls, notably a Norman piscine of very rare design, and a carved block of stone on which is roughly hewn a representation of the sacrificial Lamb. The font is of Norman date, as is also the now built up North doorway, over which, externally, is cut the figure of a dragon. 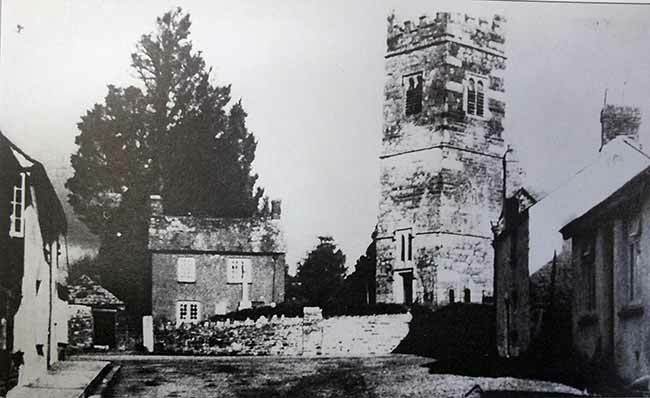 During the 14th century, and again in the 16th century, the edifice was in great part rebuilt, and in the latter century considerably enlarged, the south aisle and the Tower then being added. There is now a nave, and chancel, north transept (locally known as the Penheale Chapel), south aisle and porch, and a western Tower. For some reason unknown the church was not, when last built, set due east and west. 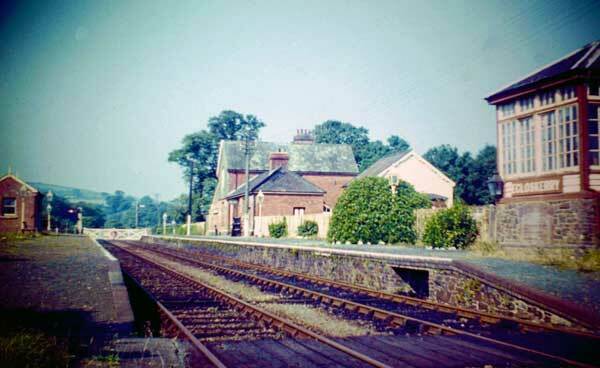 The restoration which is now receiving its finishing touches, has been contemplated for many years, but it was not until last year that the funds would admit of the work being commenced. Subscriptions were solicited by the Vicar (Rev Sloane-Evans), the Churchwardens – Messrs Stenlake and Keast, all of whom worked with praiseworthy zeal for the object in view, and a sum of about £850 was obtained, leaving about £150 to be raised, the total cost having been £1,000. Mr Otho B Peter, ARIBA, of Launceston, the Architect of the restoration, was then consulted, and the contract taken by Mr W Burt, St Thomas. 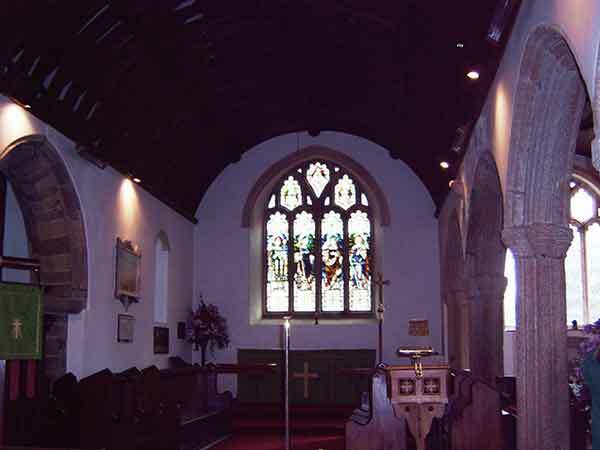 The old building was dark, damp and full of dry rot, high pews, ‘three decker’ pulpit, a large ‘squire’s seat’ with a wooden canopy resting on four Corinthian columns; an altar tomb blocking the chancel, a pit for the Communion table to stand in, walls having been more than a foot out of the perpendicular, with ivy growing through them at many points, plastered uneven ceilings decorated with dormer windows, and a gallery blocking the tower arch – all served to make the building anything but a suitable one for prayer and thanksgiving. The change wrought by the work done is very great, in fact, one can hardly imagine it the same building. The south wall has been rebuilt, the chancel raised, the windows reglazed, the whole church reseated, the aisles tiled and the roofs renewed or repaired throughout. In the new roof over the nave on two of the new bosses are ‘V.R.’ and ‘1887’, to commemorate the double event of the Jubilee and the restoration. Old monuments and sculpture stones, which before lay hidden, or almost so, have been utilised to decorate the walls, with great taste and judgement. All the fittings of the church have been renewed. Only one thing remains to complete the work, and that is a set of bells. A solitary ‘tenor’ hangs in the tower at present. The last time we heard it it was attempting to exult in the fact of a local wedding. “G – o, peaceful Sainte, Go, accept rest! E – re wee could patterne take of thee.” x x x. There is another monument to the Speccots on the south aisle wall (originally on the north Chancel wall), commemorating the death of William Saltren, of Treluddick, who died 1742. It was formerly outside the south aisle eastern wall. 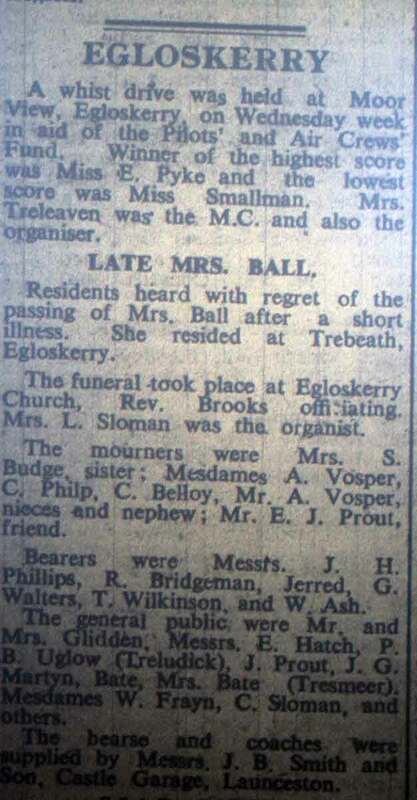 Cornish & Devon Post, February 14th, 1920: Fire At Egloskerry Church. On Sunday afternoon (8th February) Egloskerry Parish Church, which has seating for 235 persons, narrowly escaped being burned to the ground. About 2 pm, smoke was seen issuing from the roof of the south aisle and after an entrance had been effected it looked as if the flames would cross over to the north aisle. Fortunately, there was very little wind and the vigilance and promptitude of action of those assembled practically confined the fire to the south roof, two thirds of which was quite destroyed. (Our Correspondent writes}: Consternation prevailed at Egloskerry on Sunday afternoon when the news spread of a serious outbreak of fire at Egloskerry Parish church. In a short space of time, streams of people were hurrying to the scene from all directions and on arrival no time was lost in procuring all available buckets, baths, and water carrying vessels, and immediately putting them to use whilst waiting the arrival of the Launceston Fire Brigade which had been telephoned for as soon as the discovery was made. 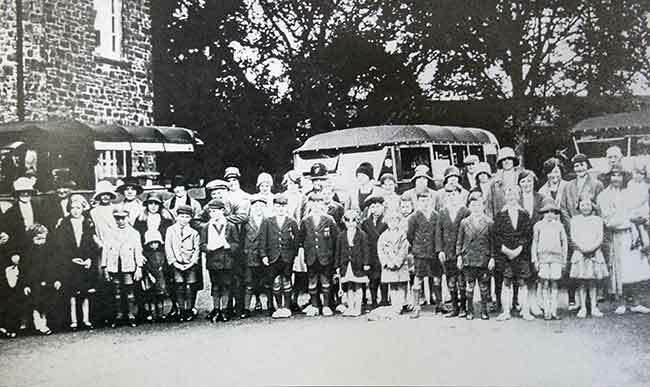 some members of the fire brigade arrived in advance of the main body with the fire engine and joined the many willing helpers from the village and neighbourhood who worked with a will carrying water from every available pump and well in the vicinity. Men, women and children alike put great efforts in assisting to subdue the flames and to particularise any special mention would be individeous as all worked like Trojans to save the building from destruction. But it may be said that the Wesleyans gave up their Sunday School and with many others assembled rendered praiseworthy services. 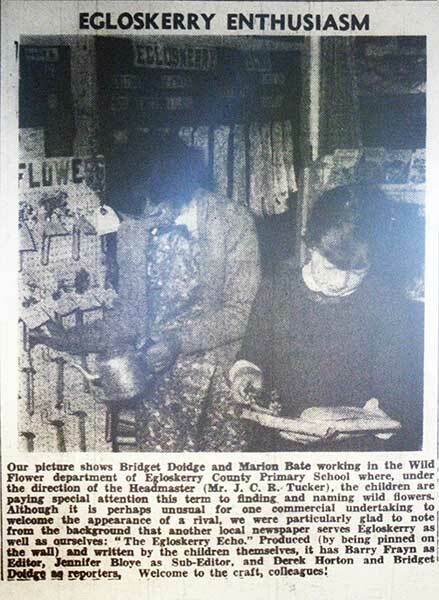 Fire extinguishers were lent by Messrs G R Vowler (Penheale) and F A Bate (Moor View), Egloskerry. Rev J H Thomas (vicar) was taking the afternoon service at Tremaine Church and was informed of the occurrence by special messenger. Openings in the roof were made in advance of the flames, and here constant streams of water were poured from buckets carried over ladders. Inside the building also a large quantity of water was thrown, which no doubt saved the seats (of pitch pine wood) from becoming ignited. All the available church furniture was removed into neighbouring dwellings. Near the seat of the origin of the fire was the Norman font and this happily appears to be undamaged, and as far as can be ascertained little or no damage had been caused to the seats, windows or walls. The pulpit and organ being at the opposite end of the seat of the fire also escaped damage. The fire was well under control on the arrival of the fire brigade, but a considerable amount of work was left to be done as there was a large quantity of unsubdued fire under the roof. An adequate supply of water for the fire engine was urgent after utilising all the available water in the well in Mr W S Jenkins’ orchard (from which a large quantity had been carried by buckets previously). The fire hose was placed in the main water supply of the village, which provided a constant supply. This happily did away with the necessity from the River Kensey, over a quarter of a mile distant, and the brigade , under the command of Captain F Raddall and Lt WT Mills, soon had a steady supply of water playing on the burning building and speedily extinguished the flames. The police in attendance were Sgt Cleave, of Launceston, and PC Warren, Egloskerry, whilst Mr G R Vowler, representing the Royal Exchange Assurance Company (with whom the building was insured), was also present. The fire originated in the west end of the church, where there was a slow combustion stove used for heating the church, and the fire was probably caused through the over heating of the pipes igniting the pitch pine woodwork of the roof. Fire was lit in the stove between 6 and 7 in the morning. 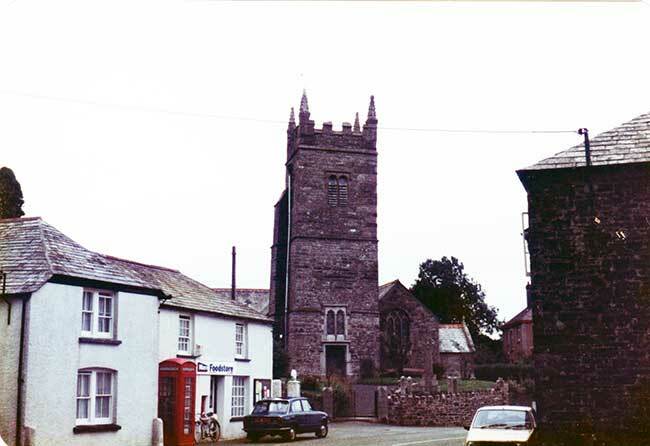 Services were held at 8 and 11 am, and when the vicar and his warden left the building about 12.30pm. everything appeared safe. 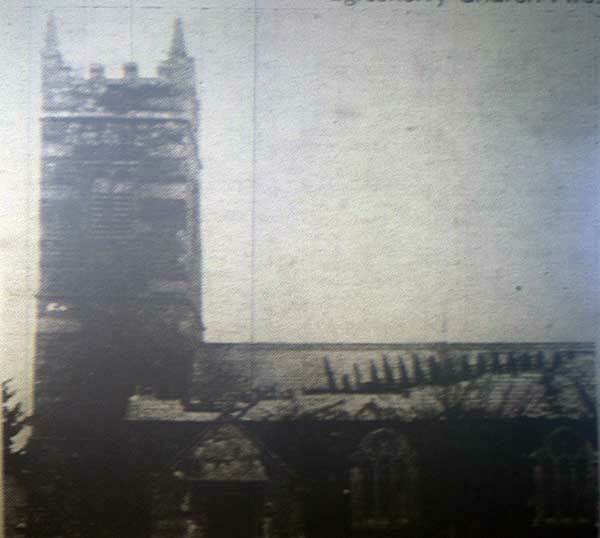 The church was restored in 1887 at a cost of £1,000, and the Registers date from the year 1575. Mr GH Ellacott of Badharlick, whilst assisting in removing the church furniture had the misfortune to injure his finger which necessitated medical aid. 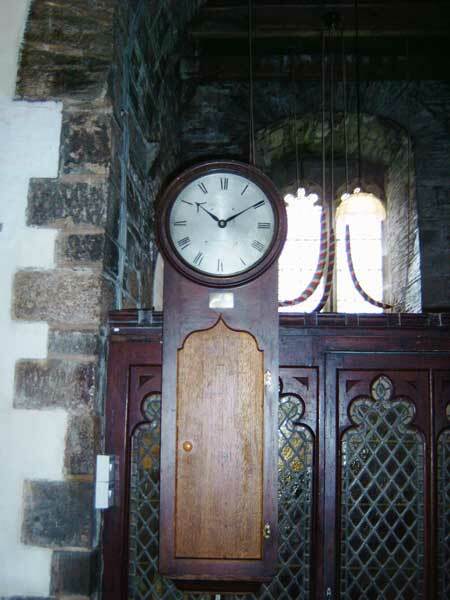 The news was received at Launceston about half-past two and the fire bell at St Mary Magdalene Church was soon in motion. Some of the members of the fire brigade were at the time attending Divine worship, which they immediately forsook and made for their post. A full brigade mustered and the horses borrowed from Mr J B Smith, Castle Temperance Hotel, were driven by Mr Pethick; Captain C Raddall, with two or three men left immediately by car for Egloskerry, and were followed shortly afterward by the engine, the steam for which was got up in an incredibly short space of time. When the brigade arrived at the scene they found that part of the roof was well afire and a corner of the second gable in danger. After the fire had been extinguished the brigade left, arriving home at about 7 pm. The mains water for Egloskerry is turned on by Sir Harold Roper in 1959. Egloskerry c.1910. Photo courtesy of Ray Boyd. 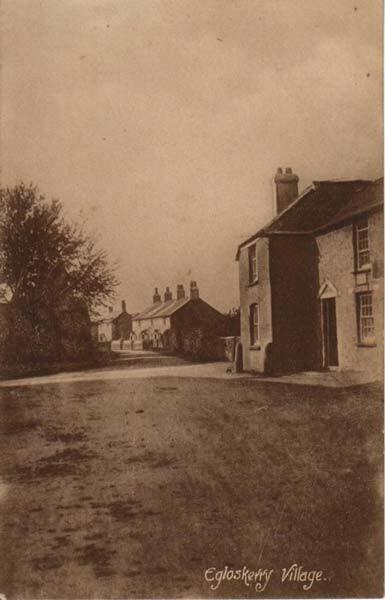 Simcoe Arms, Egloskerry. Photo courtesy of Ray Boyd. 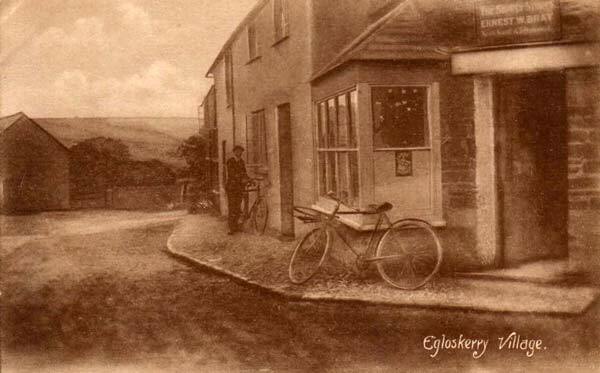 Egloskerry c.1910 Photo courtesy of Gary Lashbrook. 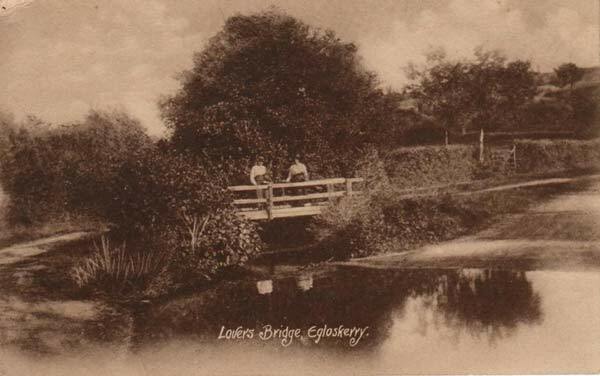 Lovers Bridge, Egloskerry. Photo courtesy of Ray Boyd. 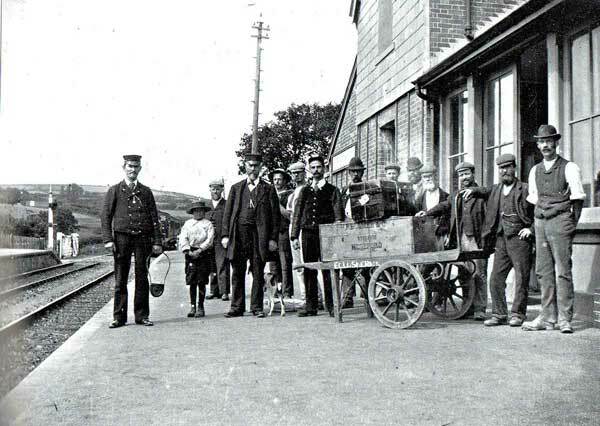 Egloskerry Post Office and staff in 1910. Egloskerry Railway staff from the early 1900's. Jimmy Donald, his sister Miss. Donald and Mr. Moffatt senior of Penheale Estate. 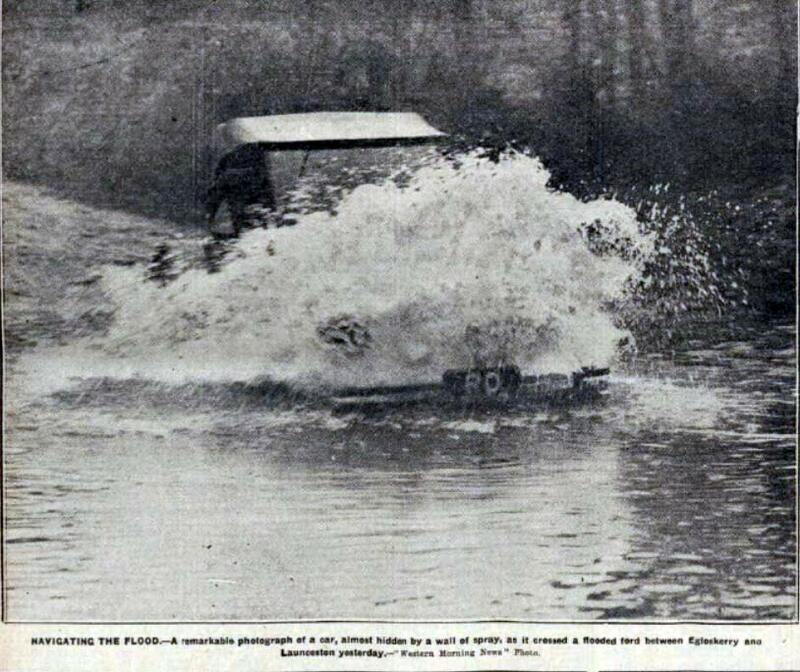 Flooded road near Egloskerry in November 1930. Egloskerry Church Cottage. Photo courtesy of Ann Caddick. Egloskerry Church and Church Cottage. 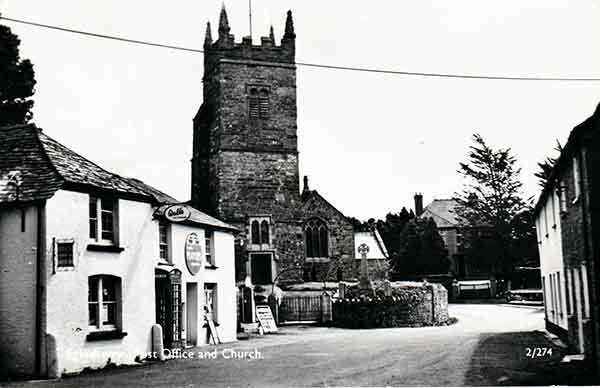 Egloskerry Post Office and Shop and Church c.1960. Egloskerry Police Station in 1964. 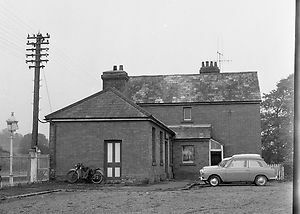 PC 4 Searle at the rear of Egloskerry Police Station in 1963. 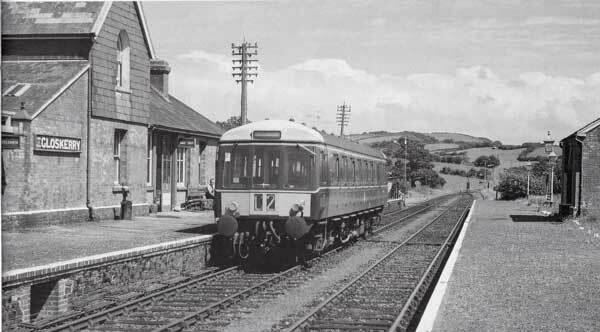 A Railcar pauses at Egloskerry Railway Station in the June of 1966. 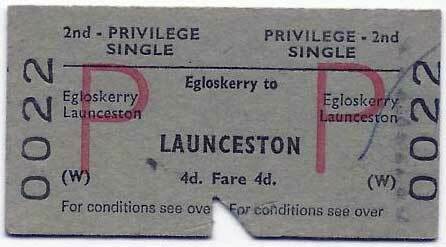 1965 Rail ticket from Egloskerry to Launceston. 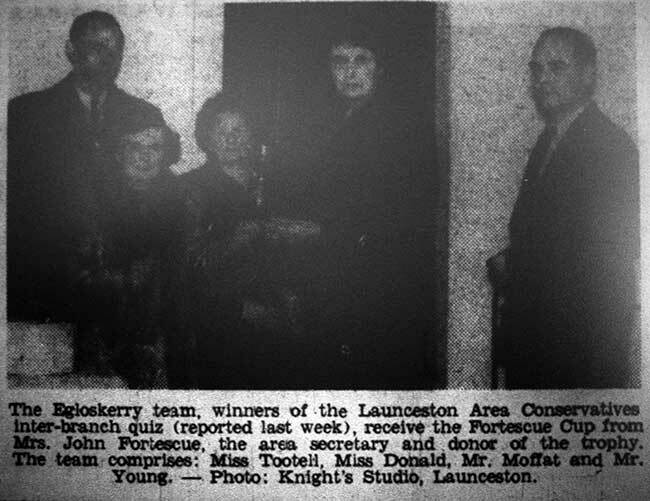 Egloskerry quiz team from December 1960. Egloskerry in the late 1970's. 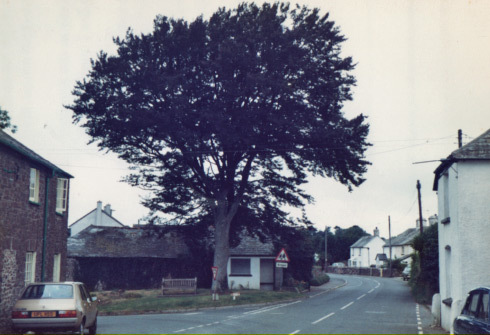 Morgan Cottages, Egloskerry in 1977. 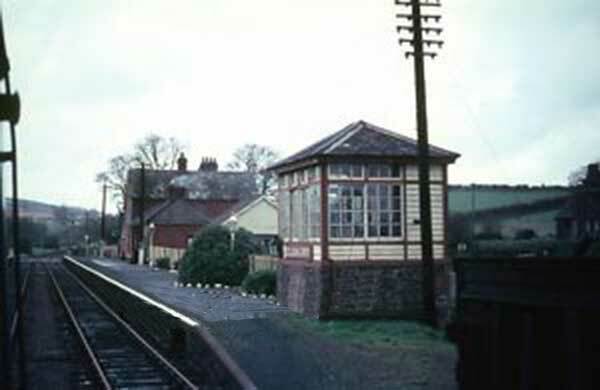 Egloskerry Post Office and Shop and Bus shelter in 1978. 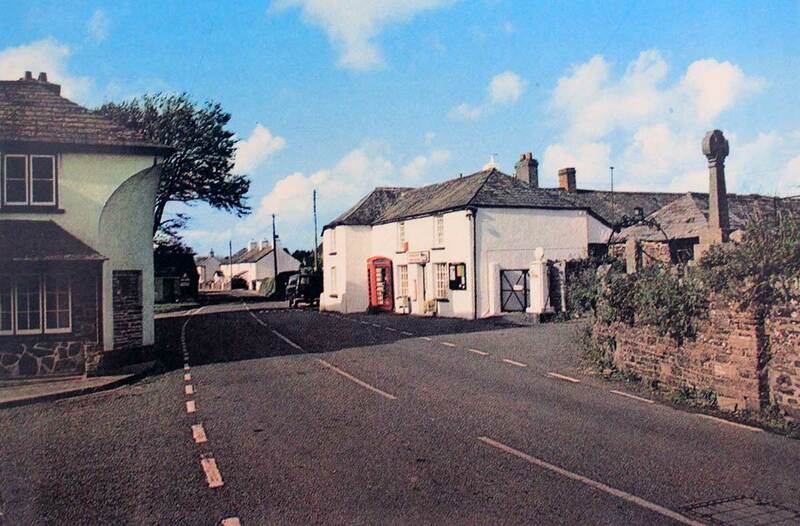 Egloskerry Post Office and Shop and Church in 1978. Egloskerry Church from the rear 1980. 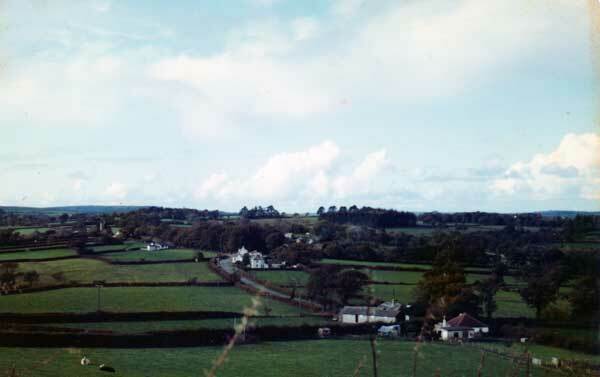 Egloskerry from Athill Farm in 1977. 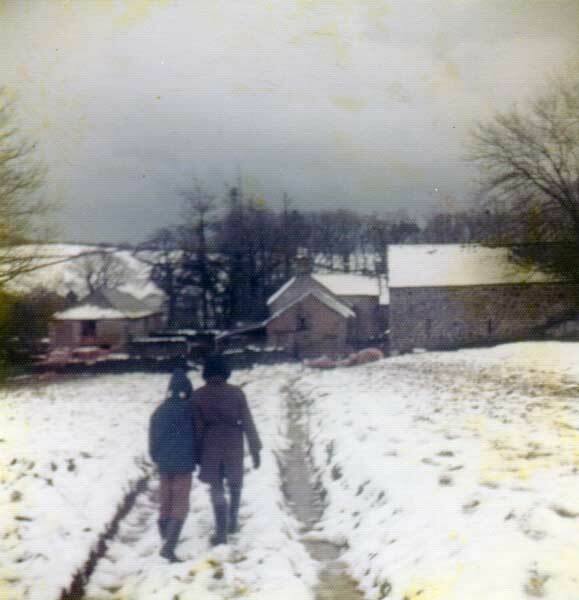 Hole Barton, Egloskerry after the worst blizzard in 15 years hit in 1978. 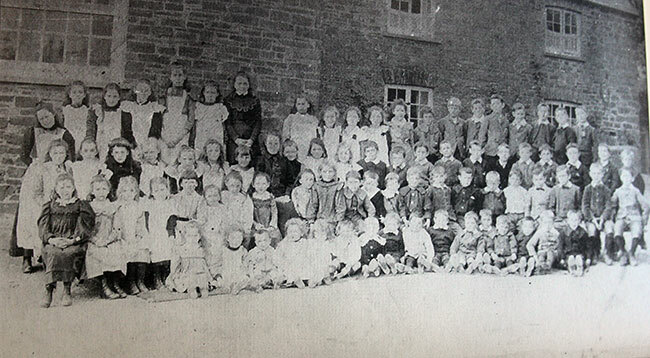 Egloskerry C. P. School in 1910. 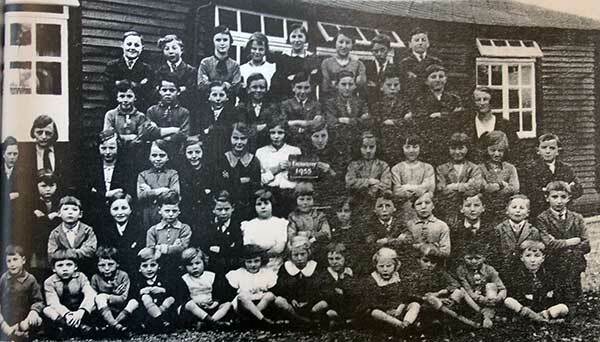 Egloskerry C. P. School in 1935. 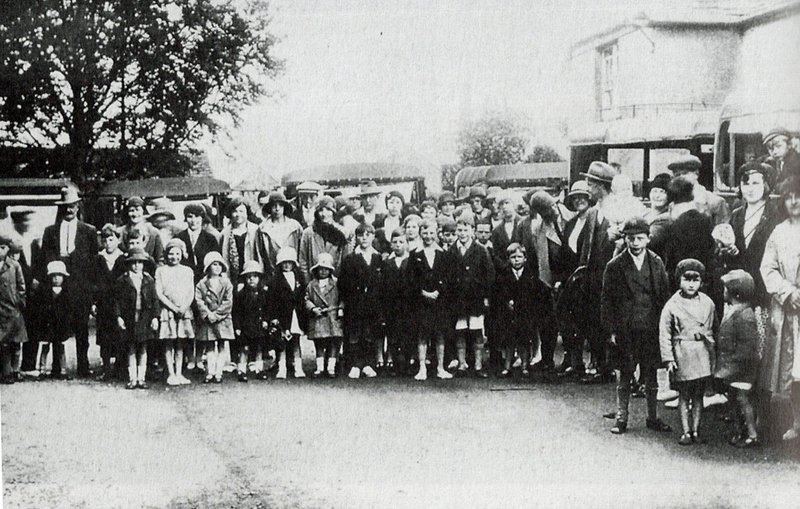 Egloskerry School outing from the 1930's. 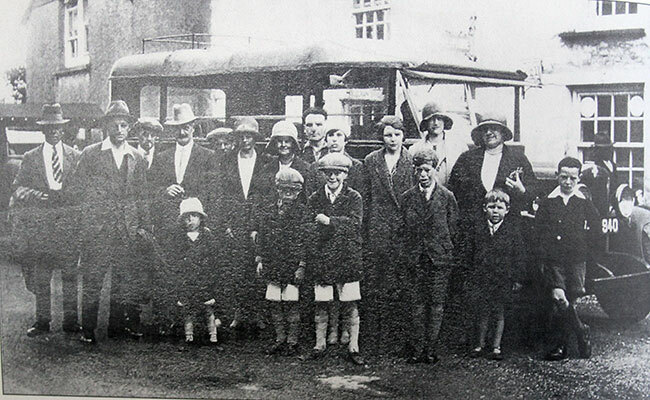 Egloskerry School outing from the 1930's with Stan Wooldridge the driver of the charabanc. 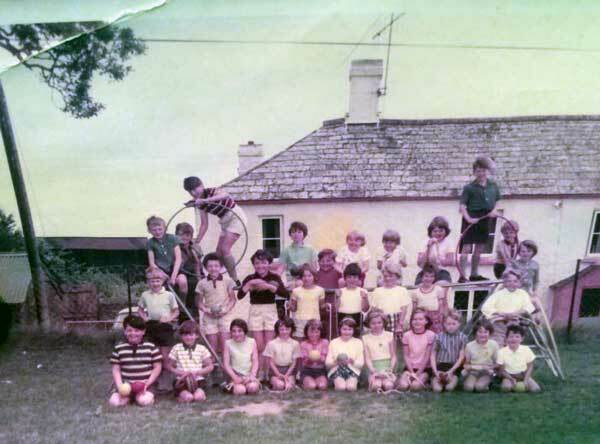 Egloskerry C. P. School class of 1966. 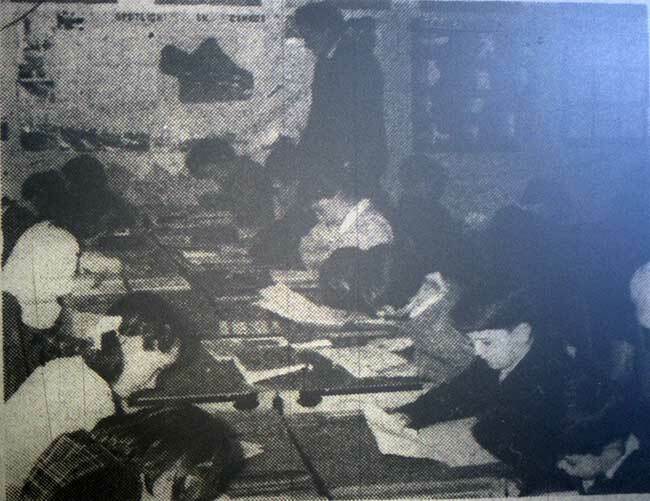 Egloskerry C. P. School in 1968. 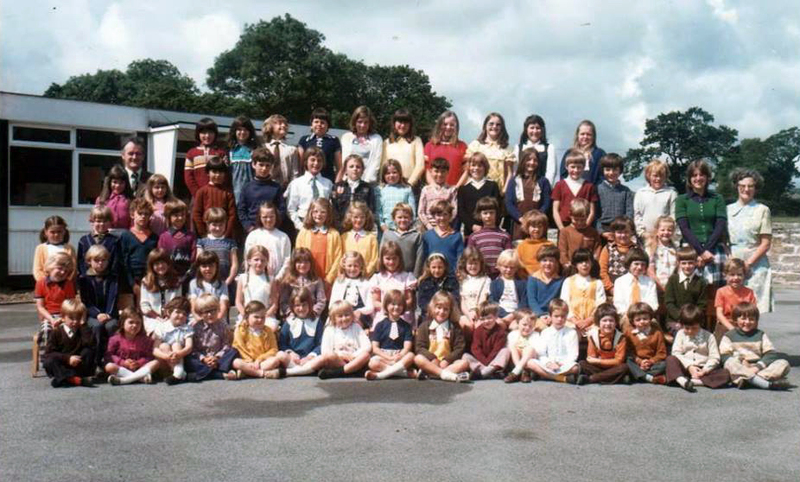 Egloskerry C. P. School in the late 1960's. Photo courtesy of Phullis Aldridge. 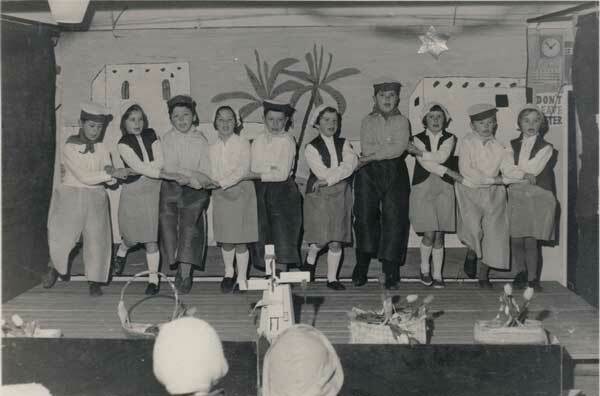 Egloskerry C. P. School Christmas concert in the late 1960's. 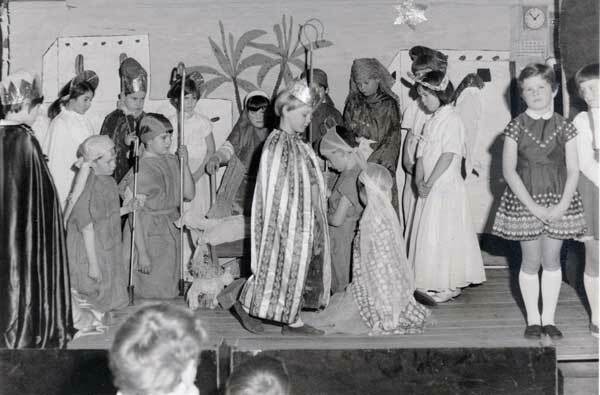 Egloskerry C. P. School Nativity play in the 1960's. 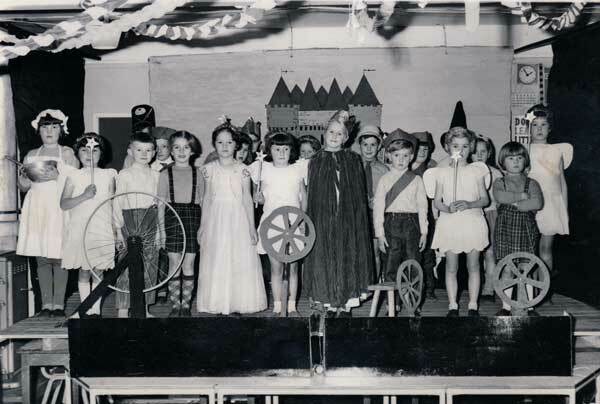 Egloskerry C. P. School Christmas concert 'Sleeping Beuaty in the 1960's. Egloskerry from Laneast Downs in 2014. 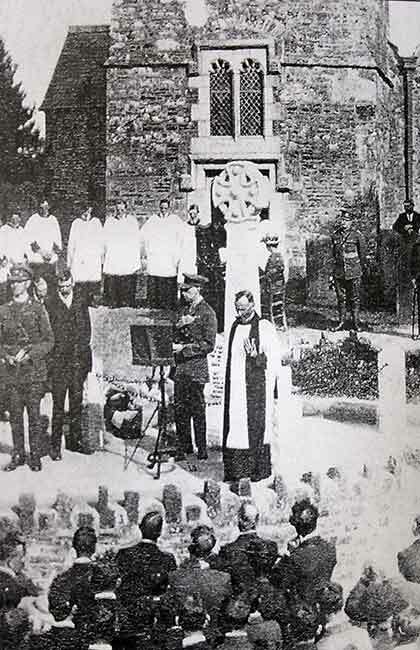 Below the dedication of the war memorial in September 1921. 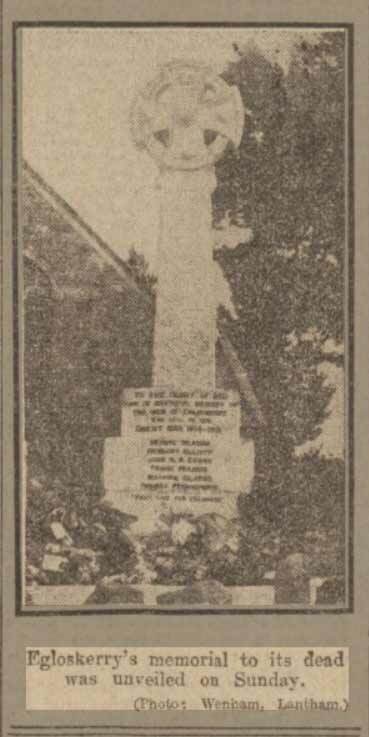 The effort to provide a suitable memorial owed its success to the vigorous initiative of Parish Councillor Mr. W. T. Phillips who after the first initiative for a memorial had fallen through due to a difference of opinion to its site, drove on to make another effort. 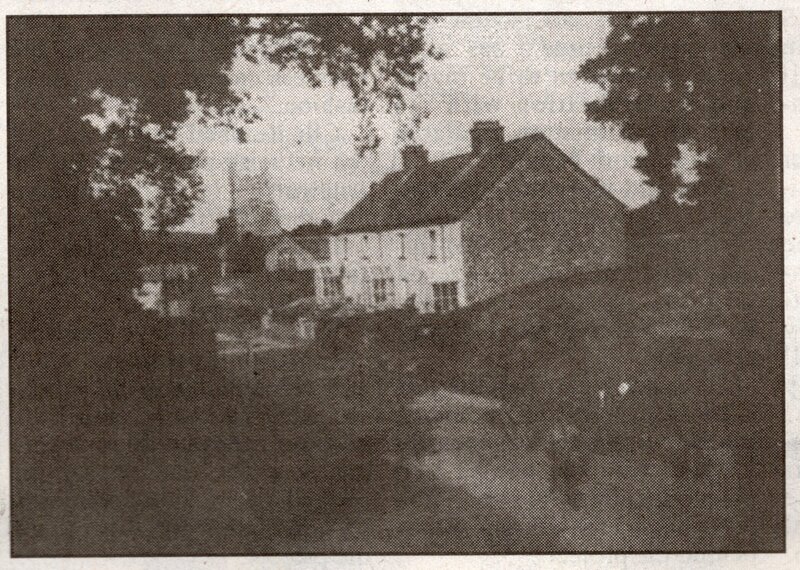 Along with Mr. W. T. Jenkin he collected from the parish the sum of £80 which covered the whole cost. A committee had been formed which included the vicar, Rev J. H. Thomas acting as correspondent. The rest of the committee was made up of Messrs E. G. Baron Lethbridge, (chairman), F. T. Francis (treasurer), J. Werring (secretary), W. T. Phillips, W. T. Jenkin, S. V. Prout, E. W. Bray, and Isaac Bright. Isaac supervised the work of laying the concrete bed with help from Mr. Symons and Mr. Reed. 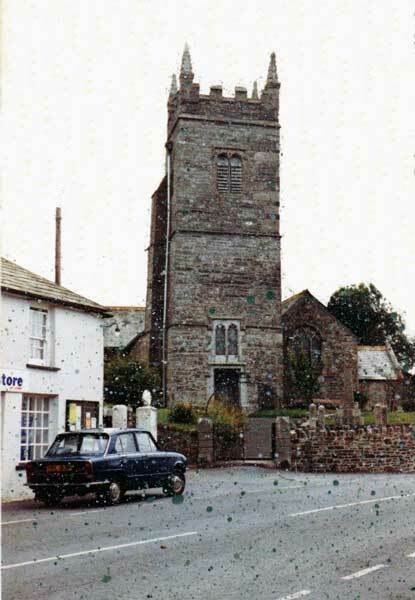 The cross was supplied by Messrs Sweet and Sons of Liskeard. The ceremony was conducted by a combined church and chapel service under the direction of the Rev. J. H. Thomas. His son, the Rev. J. Owen Thomas (vicar of Tresmeer) unveiled the cross (Rev. J. Owen Thomas had served as a Lieutenant during the war had had been severely maimed in battle). The junior Wesleyan minister, Rev. T. Owen Beswarick, gave an address and the lesson Rev. 21, was read by Mr. Phillips. 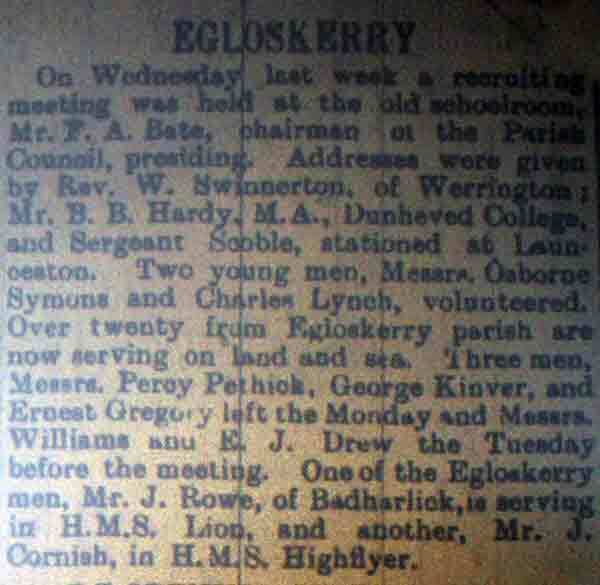 Recruitment from Egloskerry article in 1914. 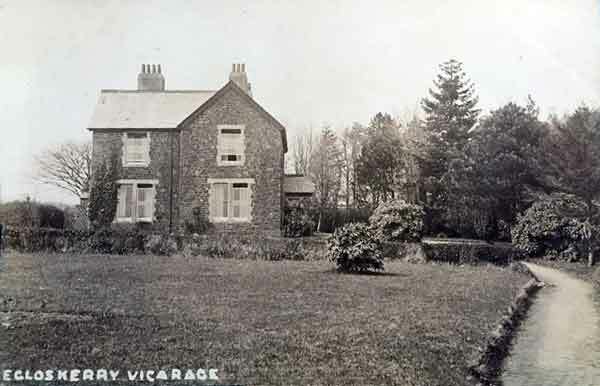 George was born in 1883 to John and Eliza Deacon at Rosehill Villa, Altarnun. His Father was a Carpenter. 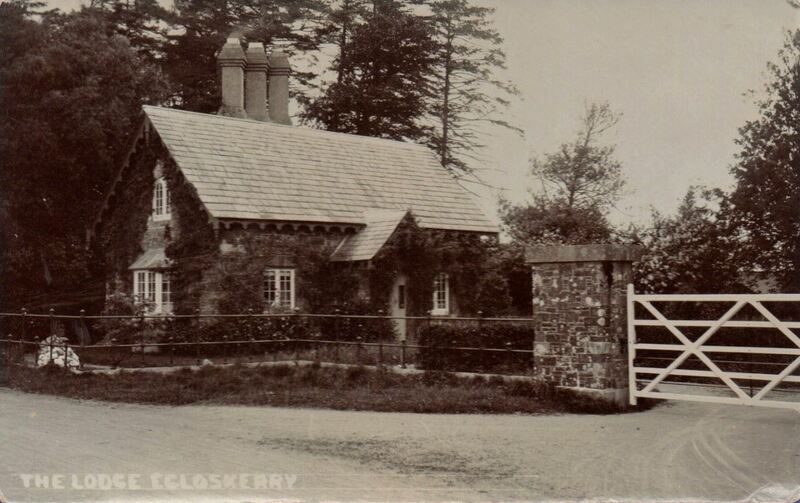 The family moved to live at Chapel Road Cottage, Egloskerry by 1901 and George was working as a Domestic Gardener. 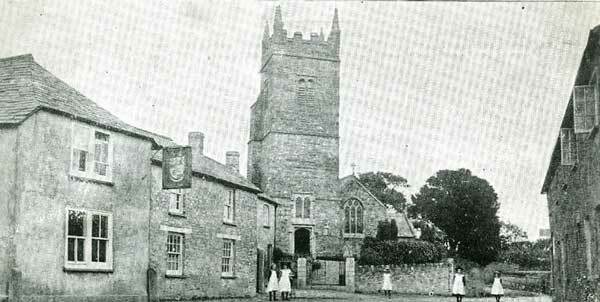 The family were living at Killicoff, Egloskerry by the 1911 census, but George was now living in Falmouth and working as a Postman. He first enlisted with the Duke of Cornwall’s Light Infantry (Regimental No. 7860) in 1902 serving in the colours for three years before becoming a Reservist for nine years. At the outset of the war in the August he was called up to serve with the 1st Battalion ‘A’ company of the D.C.L.I. part of 14th infantry Brigade, 5th Division. He was killed in Action on December 5th, 1914 by a bullet. Although he was buried at the time of his death, the grave was ultimately lost but he is commemorated at the Ypres (Menin Gate) Memorial, Ypres (Ieper), West Flanders (West-Vlaanderen), Belgium Panel 20. As well as the Egloskerry memorial he is also remembered on the Altarnun memorial. 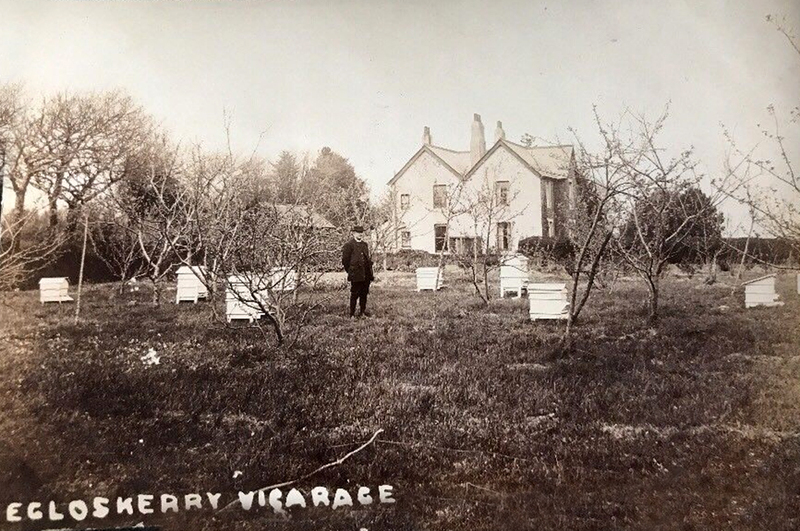 Herbert was born in 1895 to John and Mary Elliott at Keywood, Whitstone. His Father was a General Labourer. He enlisted with the Duke of Cornwall’s Light Infantry as a private (Regimental No. 240791) serving with the 1/5th Battalion. He died of his wounds at home in Egloskerry on the 15th of June 1918. 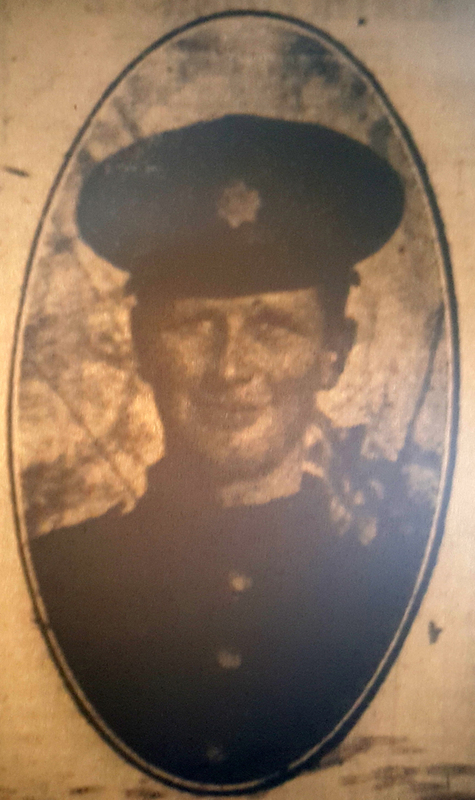 His brother John Henry ELLIOTT (7035) also fell. Jack or James as he appears in the official records was born in 1900 to Arthur and Catherine Evans at Great Warley, Essex. His father was a farmers son and a miller. He initially enlisted as a Private with the Somerset Light Infantry (Regimental No. 40585) but was transferred to the Princess Charlotte of Wales’s (Royal Berkshire Regiment) (Regimental No. 48559) serving with the 5th Battalion. Having fought during many battles such as at Cambrai and Arras, the 5th Battalion in the February of 1918 transferred across to the 36th Brigade with the 12th (Eastern) Division. The war diary for the 5th Battalion shows that they were being bused to Beauquesne on May 25th, 1918 the date given for when Jack was killed whilst attending a wounded soldier, so it is not entirely clear as to whether his Battalion were fighting. What we do know is that his death occurred during the great German Spring offensive and the battle lines at that time were very fluid. 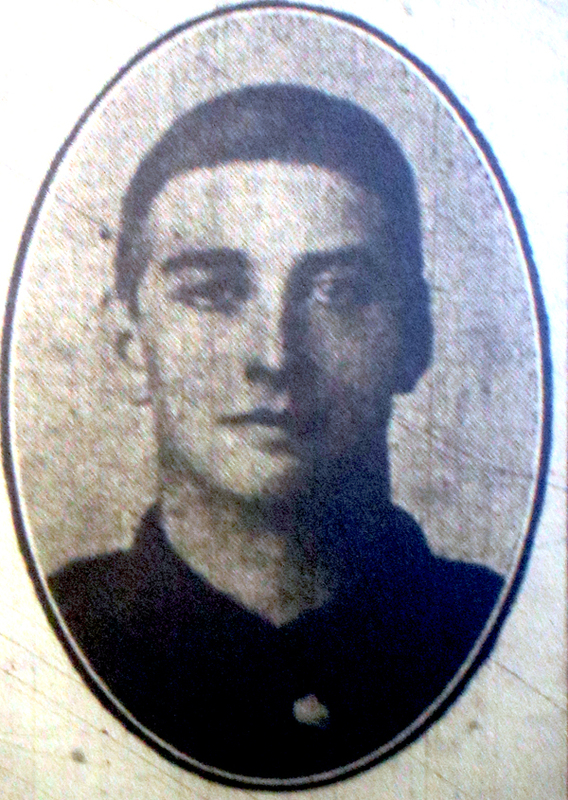 Jack’s body was never identified but his name is commemorated at Pozieres Memorial and on the Egloskerry War Memorial. At the time of his death his parents were living at The Mill House, Egloskerry. 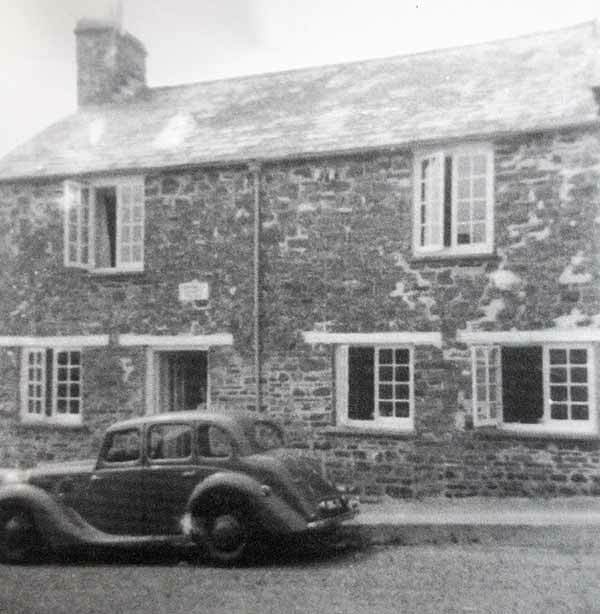 Frank was born in 1896 to Fredrick Tanton and Frances Francis (nee Westcott) at Badharlick Farm, Egloskerry and was the eldest of six children. His Father was a Farmer. 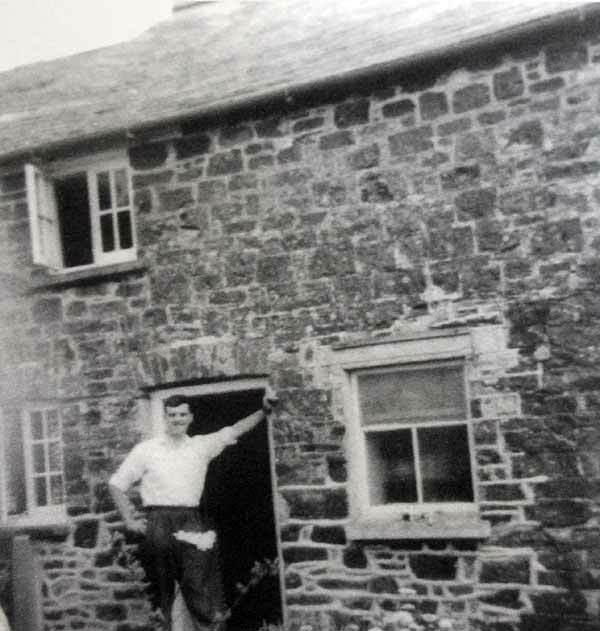 Frank went to Horwell Grammar School and on finishing his education he joined his Father working on the farm. In March 1915 he volunteered (enlisting at Teignmouth) to be a Trooper in the Royal 1st Devon Yeomanry, being subsequently transferred into the Devon Infantry (Regimental No. 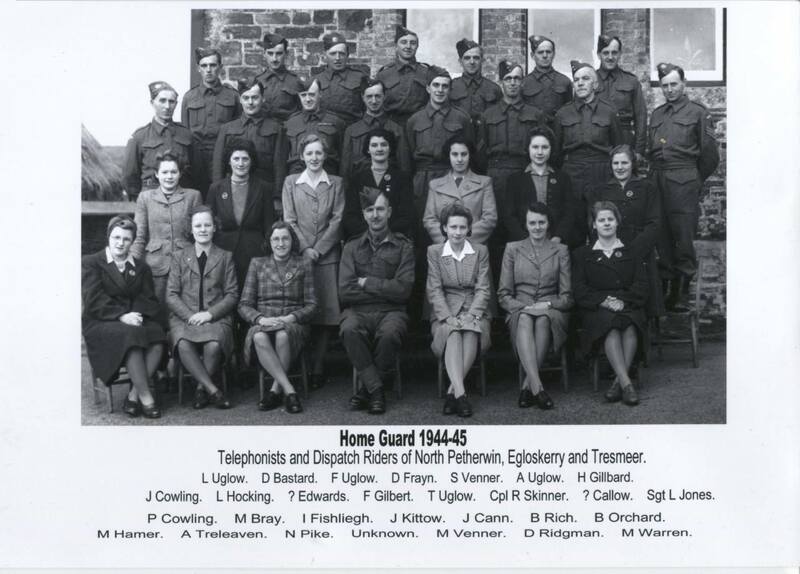 45741) serving with the 9th Battalion. He was sent to France in December 1915. During the following two years Frank and his Battalion (being part of 20 Brigade in the 7th Division in France) would see action in many battles including the ‘Battle of the Somme‘ where on the morning of July 1st, 1916, the 9th led the attack towards Mansel Copse, where well-placed machine guns, whose crews had survived the preliminary bombardment, cut down hundreds of advancing men. In April 1917 during the ‘Battle of Arras’ both the 8th and 9th Battalions attacked Ecoust with great success and light casualties but, a month later, capturing part of Bullecourt cost them 382 killed and wounded. Early October found both Battalions near Passchendaele enduring the worst of the Third Battle of Ypres. It was here that Frank was killed when a shell landed by his post on the 10th of October 1917. Frank’s body was never recovered but his name is commemorated on the Tyne Cot memorial, Zonnebeke, West Flanders (West-Vlaanderen), Belgium Panels 38 to 40 and also on the Egloskerry War Memorial. Mr. Tom Banbury, writing to Mr. Francis, said “death was due to shock. Unfortunately he was not near and did not see him. He was a great favourite with the Yeomanry boys and was a noble lad in the line, and if anyone had done his bit in this terrible war, he had.platton officer, Second Lieutenant F. Wills, writing from a London hospital after expressing sympathy, said Pte. Francis was with him at the time of his death. The whole of his post was knocked out including himself. “Your son was killed instantaneously by the concussion” said the officer” and he was not marked in any way whatever, poor boy. We were all taken by surprise, as things were fairly quiet when the Boche suddenly shelled us. I am ever so sorry. He was a good boy and he was only telling me ‘about half an hour before how you had employed a man in his place for whom you had obtained an exemption. Once again I offer my deepest sympathy and hope that you will bear up under the loss of so good a boy”. It is officially reported from Germany, through our War Office, that Maurice died in Hospital on March 30th 1918, as the result of a gunshot wound to the head. His death occurred during the German Spring Offensive that began on March 21st, 1918, and which was to cause the British Army and those of the Empire to fall back in disarray. On March 26th, the 7th Battalion of the Duke of Cornwall’s Light Infantry fought a rearguard action at Paravillers-le-Quesnoy for several hours, before the nine survivors withdrew. Reaching Le Quesnel the Division had passed through 30th Division and 61st Division, and the line being stabilised was ordered east again to take up reserve positions in Arvillers and Foiles. Holding these throughout the day before being relieved by 133rd French Division during the night of March 27th-28th. Maurice was interred in the Grand-Seraucourt British Cemetery, France, Plot 3, Row A, Grave 4. His name is also commemorated on the Egloskerry War Memorial. Thomas was born in 1888 at Reddown, Egloskerry to Lewis and Martha Penhorwood (nee Lundrey).His Father was an Agricultural Labourer. By 1911, Thomas was a Police Constable boarding with Sgt. Albert Johns and his wife, Evelina at Newquay Police Station house. He enlisted at the outbreak of war in 1914, at Newquay with the Royal Army Medical Corps (Regimental No. 1970) serving with the 25th Field Ambulance. He embarked for France on the 5th of November 1914. Thomas was killed in Action on the 10th of May 1915 at Aubers Ridge probably by shell fire in helping retrieve the wounded from no mans land. He is buried at the Sailly-sur-la-Lys Canadian Cemetery, Sailly-sur-la-Lys, Departement du Pas-de-Calais, Nord-Pas-de-Calais, France. Plot: II. C. 69. He is also commemorated on the Egloskerry War Memorial. The battle of Aubers Ridge was a British contribution to the Allied spring offensive of 1915. It was fought over the same ground as the battle of Neuve Chapelle, 10-13 March 1915, but failed to achieve even the temporary successes of that battle.The British attack was to be launched by General Sir Douglas Haig’s First Army. It was intended to send in two attacks, to the north and south of Neuve Chapelle, with the hope that the two attacking forces could meet up behind the German front lines. Haig had requested extra artillery to increase the strength of the 40 minute bombardment planned for the morning of 9 May, but all available artillery reserves had been sucked into the fighting at the second battle of Ypres, still raging just to the north. Montague Guy Pethick (Not listed on Egloskerry War Memorial but is added him here as it was his place of birth). 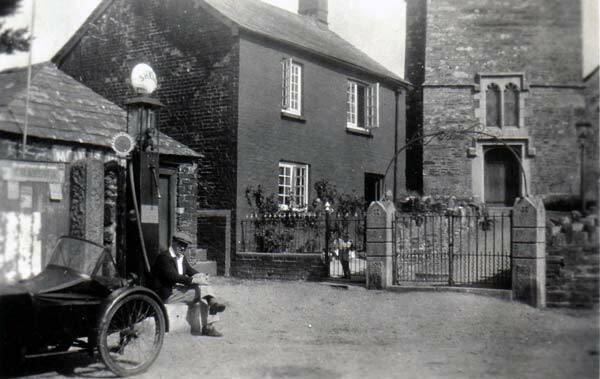 Montague or ‘Montie’ as he was known was born in 1898 to Richard and Amy Pethick at Egloskerry. 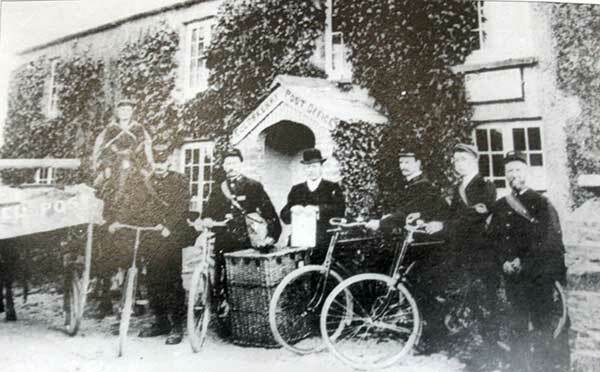 He enlisted at Salisbury where he was in business, with the Devon Cyclists Corps. From Salisbury he was sent to Horlesley in Suffolk, for training and remained there until he was drafted to France in August, 1917, where he joined the Devonshire Regiment (Regimental No. 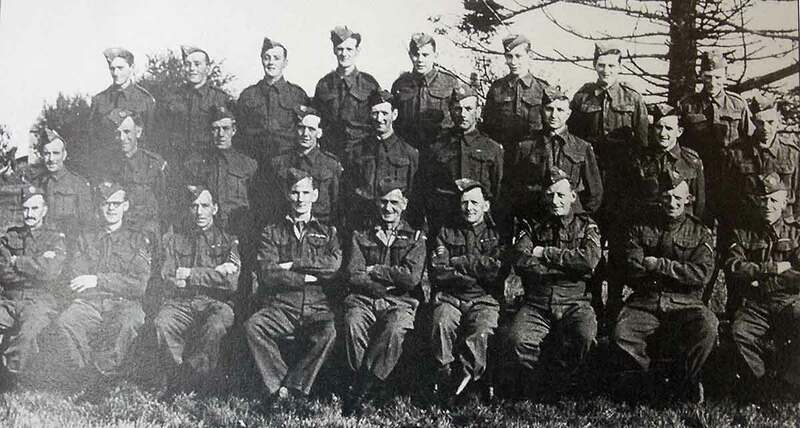 290785) as a Private with the 9th service Battalion. He was killed in action on October 26th, 1917 during an unsuccessful attack on Gheluvelt near Passchendaele. His body was never indentified but his name is commemorated upon the Tyne Cott War Memorial, Panel 38 to 40. 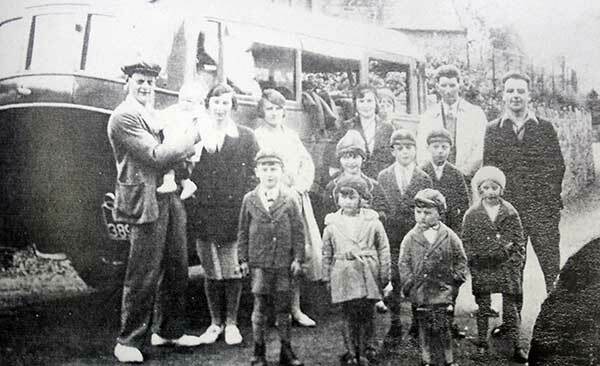 The family had moved to Milton Abbott and he is remembered on the village’s war memorial. Early October found both the 8th and 9th Battalions of the Devonshire Regiment near Passchendaele enduring the worst of the Third Battle of Ypres. On the 26th in an unsuccessful attack on Gheluvelt both lost heavily – especially among their officers, only three of whom from the two Battalions emerged unscathed. Gavin was born in 1922 at Chertsey, Surrey to Norman and Marjorie Colville. His father had served in the first World War and owned Penheale Manor and Estate. He enlisted with the RAF as a Sergeant (Service No. 929677) serving as a pilot with 40 Squadron flying a Vickers Wellington IC. He was initially reported as missing but was killed in action on the 2nd of November 1941 whilst fighting at Tripoli, Libya. He was interred in the Municipal Cemetery at Tripoli, Grave11. G. 18. 40 Squadron operated Bristol Blenheim Mk IV light bombers from RAF Wyton from December 1939 until November 1940, when it converted to Vickers Wellingtons in the night bombing role. On the 14 April 1940 one of the Squadrons Blenheims (L9207) was taken on an unauthorized flight by AC2 JFB Lewis and crashed in the Thames Estuary. 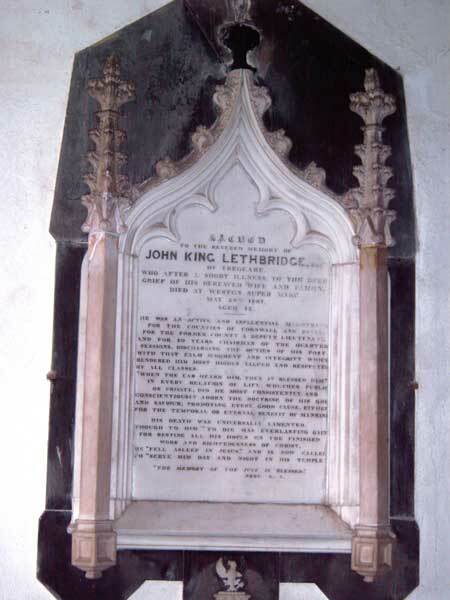 His body was not found and he is remembered on the Runnymede Memorial. After operating a detachment in Malta from October 1941, the squadron moved there in February 1942, the remaining UK-based element being renumbered No. 156 Squadron RAF. It later moved to Egypt, Libya, Tunisia and then, in December 1943, to Italy. 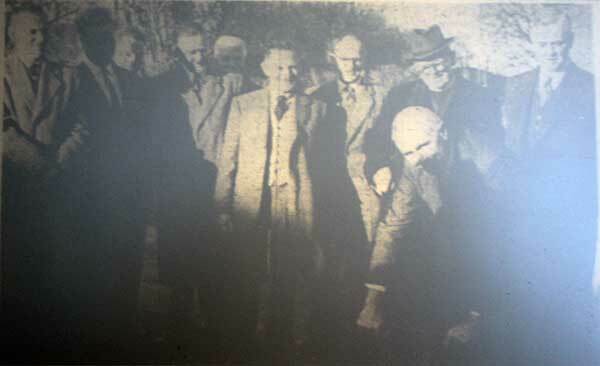 Middle row Alan Jenkin, Horace Gillbard, Farmer Harris,?, ?,?, Douglas Frayne, Albert Pyke, Albert Cross. Front row Stan Reed, Bob Moffatt, ?, Willis, Harry Gould, Titball, John Grylls, Arthur Francis, Percy Wren. The stores for the Homeguard were situated in a nissen hut at the end of the top lane at Hole Barton. Newspaper report in 1809 of an Egloskerry burglary. 1920 report on the sale of the Penheale Estate. Cornish and Devon article from 1945. Egloskerry Church organ renovation report from 1965. Report into the serious accident involving the Rev. Patrick Howlett in 1967.